People whose larynx is surgically removed - e.g. due to laryngeal cancer - are forced to use substitution alaryngeal voices. 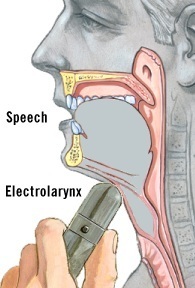 One of the first postoperative voices for most patients is the Electro-Larynx voice which is produced with the help of a small hand-held, battery-driven device. Although it is easy to use and the intelligibility is good, the unnatural, mechanic and robotic voice is a major drawback. Furthermore, the disturbing background noise from the device itself and the low volume are problems which have to be improved. The Electro-Larynx is used since decades but since then the quality has not been improved. The goal of this thesis is to develop a new Electro-Larynx which has a significantly better output speech than existing products. Together with the company HEIMOMED from Germany and the Department Of Phoniatrics, Speech And Swallowing at the University Clinic Of Otorhinolaryngology, Graz, the sound of the voice and the speech melody should be improved and implemented in an efficient way. This thesis is supervised by Martin Hagmüller, Gernot Kubin.